Some notes on using a 7750 for Dogecoin mining. Should be relevant for any Scrypt-based coin such as the popular Litecoin. I’m using cgminer 3.7.2 which is an old version, but the most recent version of cgminer to support scrypt based mining. I found that I needed to set my fan speed to 100%. The 7700 series seems to desire much cooler temps than other cards. Mine is happiest at around 63 degrees Celcius. Above 65 seems to hot for it and it produces too many HW errors. Other cards I’m using are fine at around 75C. I find it very hard to eliminate HW errors entirely. I think they’re bad because too many affects the quality of your hashing and can eventually damage your card. I can find very little information on acceptable HW error rates, but one guy says he shoots for below 1% of your A and R added together. Update: A reader sent in his settings, which hash slightly faster than my own setup but have no hardware errors at all. Let’s do the math quick. 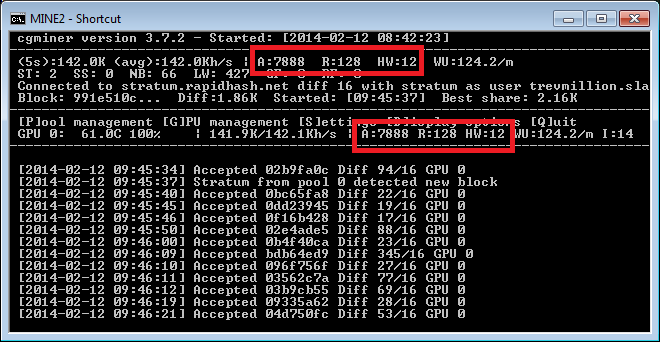 7888 (accepted hashes) plus 128 (rejects) = 8016. Divide by HW errors (12) to get 0.15% Well below 1% so I called it good enough. But if you bump intensity ( the “I” figure) up from 14 to 15, HW errors start to multiply like soldiers after the war. This is a low-intensity card, which is why no one buys it specifically for mining. But if you happen to already have one lying around it makes a great casual miner when you’re not using it. Here are my batch file settings for minimal HW errors for zero hardware errors. Text in light blue needs to be replaced by your own figures. When I want to be able to use my desktop and watch youtube videos I set gpu-engine to 870. This setup should hash at a stable 166 kh/s. Thanks to Paul for sending in these new settings which are better than the ones I was using. This entry was posted in Computers, Cryptocurrency. Bookmark the permalink. I’m running 2 7750s one is a HIS low profile and the other is a normal xfx, both are the 1gb gddr5 versions. I’m getting zero hw and getting around 167khash per card. my fans run at 70% and my temps are 70-71c. Very interesting. I’m sending you a message about your config so I can hopefully update this piece with better information. Hi there I’m new to this business. 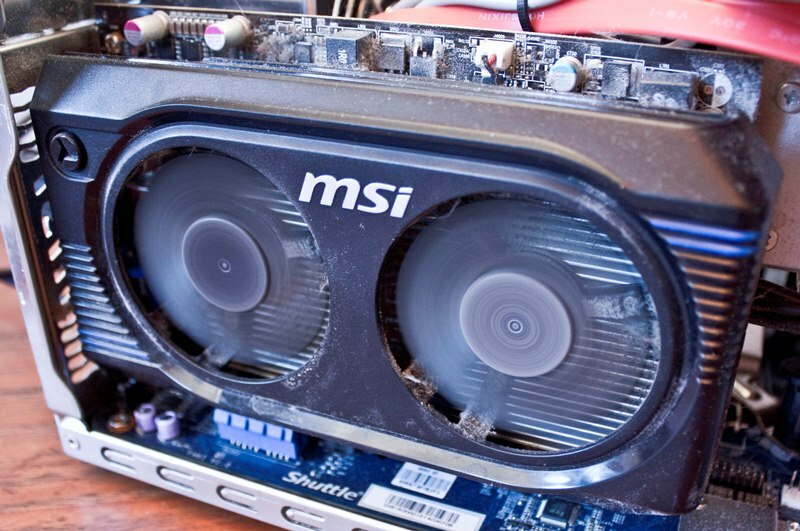 I have a pc with HD 5450 ati radeon GC. I would like you help me configuring this GC for cgminer software. My specs are: Ati Radeon HD 5450 2 gb ddr3. Thanks in advance for your help.